The SGA is a read/write memory area that, along with the Oracle background processes, form a database instance. All server processes that execute on behalf of users can read information in the instance SGA. Several processes write to the SGA during database operation. 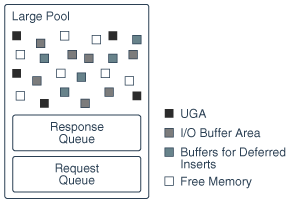 The following figure shows the structure of the buffer cache when multiple pools are used. The cache contains default, keep, and recycle pools. The default block size is 8 KB. The cache contains separate pools for tablespaces that use the nonstandard block sizes of 2 KB, 4 KB, and 16 KB. In contrast to the default mode, which is automatic, the force full database caching mode considers the entire database, including NOCACHE LOBs, as eligible for caching in the database buffer cache. This mode is available starting in Oracle Database 12c Release 1 (12.1.0.2). Enabling force full database caching mode does not force the database into memory. Rather, the entire database is eligible to be cached in the buffer cache. Oracle Database caches tables only when they are accessed. The large pool manages memory differently from the shared pool, which uses an LRU list so that portions of memory can age out. The large pool does not have an LRU list. When the database allocates large pool memory to a database session, this memory is not eligible to be released unless the session releases it. As soon as a portion of memory is freed, other processes can use it. By allocating session memory from the large pool, the database avoids the fragmentation that can occur in the shared pool. For a special type of insert known as a deferred insert, the database allocates buffers from the large pool. For rapid “fire and forget” inserts from Internet of Things (IoT) applications, the database infrastructure creates performance overhead. For example, the code path includes buffer cache navigation, buffer pins, and concurrency protections. Array inserts minimize these costs, but the array must be built on the client side, which is not typical for Internet of Things applications. To address this issue, an Oracle application can use a hint to insert rows into a table specified as MEMOPTIMIZE FOR WRITE. The application sends MEMOPTIMIZE_WRITE inserts to a middle tier, which can aggregate the data. While an IoT application will almost always send inserts to the middle tier, it is also possible to send inserts directly to the database. For example, using SQL*Plus sends the inserts directly to the database. The middle tier writes the aggregation of inserts to the database server. Optionally, the middle tier client retains a local copy of the data that it wrote in the previous step. A server process writes data to a buffer or buffers in the large pool. After instance startup, the first MEMOPTIMIZE_WRITE insert allocates the buffers from the large pool. The writer chooses a buffer from the list of available buffers. If the chosen buffer is not locked, and if this buffer has free space, then the client writes to the buffer, stamping each buffer write with a session-specific sequence number. If not, then the writer returns to the preceding step, and continues in this way until either a buffer is found or sufficient space has been freed in the large pool. The database creates a server-side array from the buffered data. The Space Management Coordinator (SMCO) and its helper processes (Wnnn) write the array to disk asynchronously using the standard data block format. Unlike standard inserts, deferred inserts are automatically committed and cannot be rolled back. The database commits the inserts to a given object in the order in which they appear within a session. There is no guarantee of ordering between objects or sessions. The database supports constraints and index maintenance just as for regular inserts. However, the database performs evaluations during the write to disk, not the write to the large pool. For best performance, Oracle recommends disabling constraints. If a primary key violation occurs when the background processes write to the data files, then the database writes the flagged row to the trace file of the apply process. The following figure depicts the workflow for deferred inserts. Description of "Figure 14-12 Deferred Insert Mechanism"
"Read Consistency and Deferred Inserts"
Some SGA subareas are only enabled for specific performance features. The memoptimize pool stores buffers and related structures for heap-organized tables specified as MEMOPTIMIZE FOR READ. 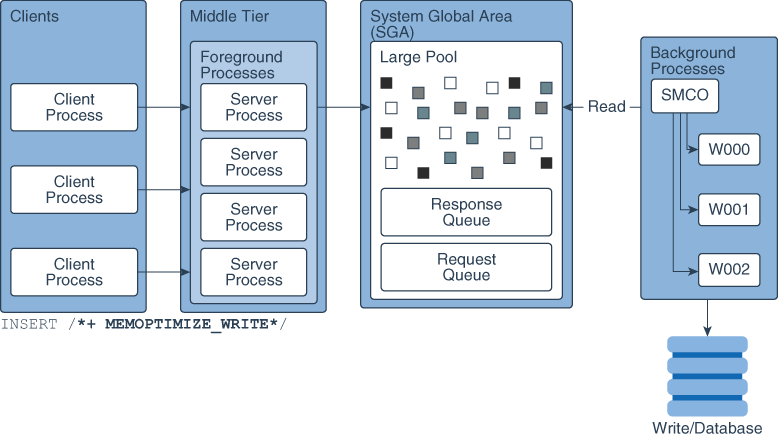 This structure provides high performance and scalability for key-based queries such as SELECT * FROM cust WHERE cid = 10. To reduce end-to-end response time, clients pull requested buffers directly from the SGA over the network, avoiding CPU and operating system overhead. Applications can benefit from the memoptimize pool without requiring code changes. To avoid disk I/O, the database permanently locks buffers for MEMOPTIMIZE FOR READ tables in the memoptimize pool, until the table is marked NO MEMOPTIMIZE FOR READ. The memoptimize buffers use the same structure as buffers in the database buffer cache. However, the buffers in the memoptimize pool are completely separate from the database buffer cache and do not count toward its size. The memoptimize buffer area occupies 75% of the memoptimize pool. 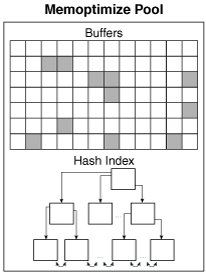 A hash index is a non-persistent, segment data structure. The database allocates the hash index as multiple, noncontiguous memory units. Each unit contains a number of hash buckets. A separate map structure correlates a memory unit with a primary key. The hash index occupies 25% of the memoptimize pool. Description of "Figure 14-13 Memoptimize Pool"
To enable the memoptimize pool, set the MEMOPTIMIZE_POOL_SIZE initialization parameter to an integer value (the pool is disabled by default). The value specifies the amount of SGA to allocate to the pool. The MEMOPTIMIZE_POOL_SIZE value does count toward SGA_TARGET, but the database does not grow and shrink the memoptimize pool automatically. For example, if SGA_TARGET is 10 GB, and if MEMOPTIMIZE_POOL_SIZE is 1 GB, then a total of 9 GB is available for SGA memory other than the memoptimize pool. To change the size of the memoptimize pool, you must set MEMOPTIMIZE_POOL_SIZE manually and restart the database instance. You cannot change the pool size dynamically using ALTER SYSTEM. The DBMS_MEMOPTIMIZE package enables you to explicitly populate a table into the memoptimize pool.